Being recognised with a Certificate of Excellence from the world’s largest travel site is an honour, and The Lodge at Chaa Creek’s general manager says the biggest satisfaction from the TripAdvisor award is that it comes directly from guests’ reviews and reflects so well on the popular Belizean eco-resort’s staff members. The Lodge at Chaa Creek’s recent award of a “Certificate of Excellence” from TripAdvisor is the result of an ongoing commitment towards excellence that reflects on the Belizean eco-resort’s entire staff, according to general manager Bryony Fleming Bradley. The award also highlight’s Belize’s rise as the travel destination of choice for many tourists, she added. Ms Bradley, speaking after hearing from TripAdvisor on May 23 2016, said that Chaa Creek’s 135 member staff all deserved recognition for once again being acknowledged by the world’s largest travel site. TripAdvisor, which claims 350 million unique monthly users generating 200 new contributions every minute, is billed as the world’s largest travel site, reviewing some six and a half million businesses in 48 countries with reviews in 28 languages. Certificates of Excellence are based on reviews submitted by travellers over a 12-month period, and are awarded to businesses that have maintained an overall TripAdvisor rating of at least four out of five from of a minimum number of reviews, according to the organisation’s website. Ms Bradley agreed that travellers trusted TripAdvisor reviews, and said that travel industry professionals anxiously watched the site to see how their business were rated. “Because the reviews come from travellers, they are trusted by their peers, and this is why they are so important. We monitor the site, and take a lot of pride in the fact that Chaa Creek consistently gets favourable to excellent comments. It’s a real barometer about how you’re doing and how people feel about you. “What we really enjoy is that, in addition great comments about our accommodation, food, amenities and service, people constantly rave about how warm and friendly Chaa Creek staff members are. That’s something that comes naturally, and says a lot about us not just as an eco-resort, but as an extended family that enjoys working together and looking out for our guests,” she said. Situated within a 400-acre private nature reserve in a pristine rainforest setting on the banks of the Macal River in western Belize, The Lodge at Chaa Creek offers a range of accommodations from their signature thatched-roof, cottage style rooms to luxury suites enjoyed by members of the British royal family. 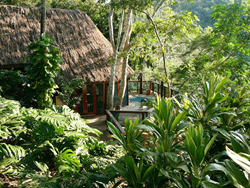 A Macal River Camp with simple bungalows called casitas is also available. Amenities include a restaurant and lounge featuring farm-to-table dining with fresh produce from the resort’s traditional Maya organic farm and seafood from the Belize’s Caribbean coast, an infinity pool, the internationally recognised Hilltop Spa, Belize Natural History Museum, butterfly exhibit and more. Ms Bradley said that onsite activities include canoeing, horseback and mountain bike riding, guided birding and nature walks, exploring ancient Maya archaeological sites, guided river excursions and ATV jungle safaris. Chaa Creek also offers tours and excursions to ancient Maya sites, including the sprawling cities of Caracol and Tikal, nearby Xunantunich, Cahal Pech and El Pilar, as well as sacred ceremonial caves such as the artefact-laden Actun Tunichil Muknal. “Our partnership arrangements with some of Belize’s most well known Caribbean resorts allow us to offer guests seamless vacation packages that split their time between Chaa Creek and Belize’s cayes, Great Barrier Reef, the famous Blue Hole and other Caribbean attractions, and similar arrangements with Guatemalan partners makes cross-country Maya excursions easy and affordable,” she said. “We are proud that, as a family business, we built Chaa Creek up over the years from our small farm to become one of Belize’s premier eco-resorts,” Ms Bradley said, “but again, what really sets us apart, and one of the reasons why we rate so highly in travel sites like TripAdvisor, is our people. We have staff members who have been here for decades, and that makes for a smooth running, happy place that’s professional, yet still warm and personable. “When we display our Certificate of Excellence again this year it sends a positive message to our guests, but for me, what more important is that it tells each and every member of our staff ‘Well Done’. And the fact that that the message comes from guests who have stayed with us is what makes this award so satisfying,” Ms Bradley said.